Now THAT’S a Mountain Bike! 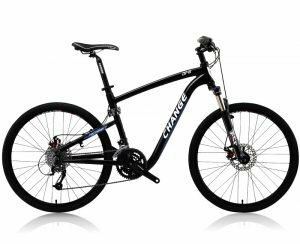 We’ve had a mountain bike on the site for a while, with excellent climbing gearing, sturdy wheels, heavy-duty brakes for safe descents, and the only folding frames that pass the rigorous EN 14766 mountain bike reliability test. But that’s not enough anymore. Today’s quality mountain bikes need other features, like front suspension and knobby tires. So we reclassified our previous “mountain bike” as a “ruggedized hybrid” and added another level of mountain bike performance with the CHANGE DF-609 suspension mountain bike. 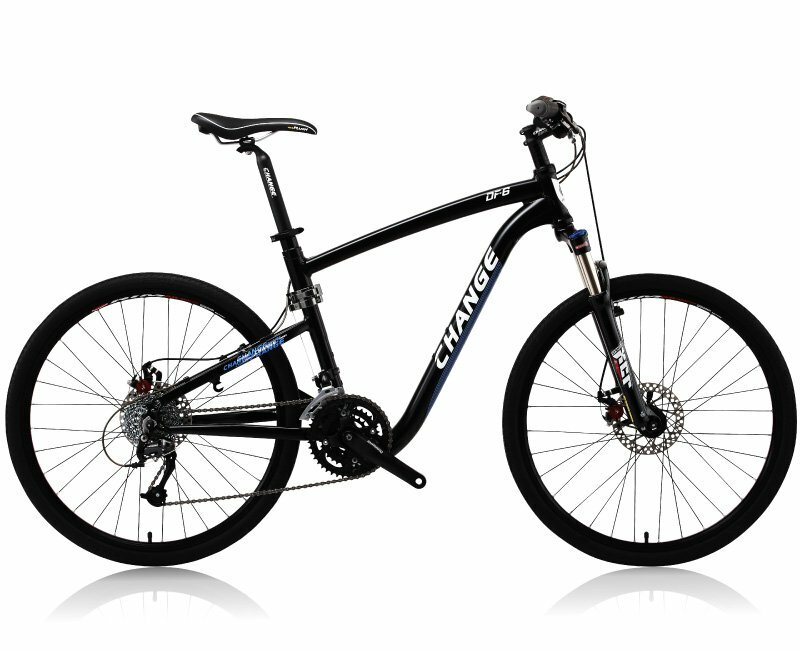 The CHANGE DF-609 is in a category of mountain bikes called “hardtail” bikes, with a focus on front suspension. How does the CHANGE DF 609 compare to other hardtail bikes in weight, price and quality? It’s in the same price and quality range as a Trek Cobia…but at 28 pounds, weighs two pounds less, has pop-off pedals to protect other bikes in close proximity, and folds in half so you never need to use a car rack. It’s in the same weight and quality range as the Trek Superfly 5…but has 7 more gears, costs two hundred dollars less…and fits securely in your trunk when you’re done riding. 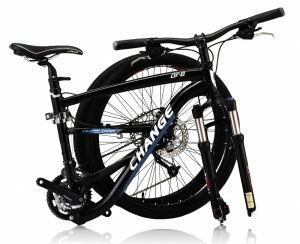 It’s in the same weight and price range as the Cannondale Trail 1, and does have three fewer gears…but it costs two hundred less…and you get the usual CHANGE Bike folding advantage that makes your biking investment easier to use in more places. It’s the only durability-certified mountain bike you can take with you in any car, fit on any bus, and store in any apartment closet. Now THAT’S a mountain bike you can put to use! It’s convenient cycling, redefined. Check out the DF-609 hardtail mountain bike today. Did you invent this full-size folding bike? I think we covered mountain bike comparisons. But if there’s something else we missed, let us know, OK? Given the recent massive fatbike explosion – almost every brand now makes a least a model – fatbike tyres may well become easier and easier to source. That ’ s a tough one. They’re such different bikes . I carry a fair bit of kit, and rode the bike hard, mountain biking too.